Waggle, who spent six years in the development of Wu Wei, has integrated martial arts philosophy, Chinese internal and external artistry that features kung fu masters and humble monks (lineage holders) as they try to unify their people over an ambitious, evil emperor. Through historical references and research information provided by the Martial Arts History Museum, Wu Wei is a wonderful combination of gaming and the martial arts. “The martial arts is a huge industry and the golden age of gaming seems to be upon us again, the museum is thrilled to be part of this new era of recreation and martial arts,” adds museum president Michael Matsuda. To serve as a launching pad to the general public, Waggle will unveil the game on Kickstarter beginning March 20, 2017. The Kickstarter campaign features the game at $59, including free shipping to individuals in the U.S., U.K. and Canada. Wu Wei has been play tested by various groups including the First Exposure Play Test Hall at Indy GEN CON and the UnPub room at the Dallas BGG Con. Wu Wei has incredible and innovate design work laced with state-of-the-art mechanics. The game accommodates from two to six players focused on ages 14+. “Players control two pieces and must move one of them to a new space on the board each turn. As a master, you aspire to train your student, preserve your lineage, and move your pieces to the center tile. One player controls the emperor and his general and seeks to place towers in the four corners of the board to win control of the empire,” notes Waggle. 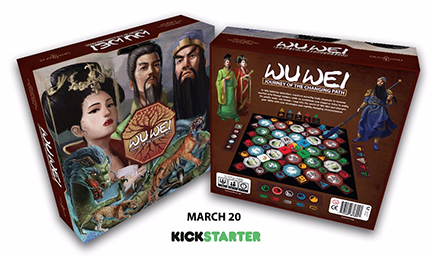 The Martial Arts History Museum will be playtesting Wei Wu at their Museum Game Night on March 25 at 6 pm to 9 pm. The museum is located at 2319 W. Magnolia Blvd., Burbank, CA 91506. Entrance is free for this event. For information about Wu Wei: Journey of the Changing Path, visit their website at http://www.playwuwei.com or their press page at http://graywolfgames.org/press. To contact Justin Waggle email him at Justin@graywolfgames.org or call (925) 998-4246. For information about the Martial Arts History Museum, visit their website at http://www.Mamuseum.com or call (818) 478-1722.